Try this favorite fall and holiday treat loved by the Dutch while fresh picked apples abound. 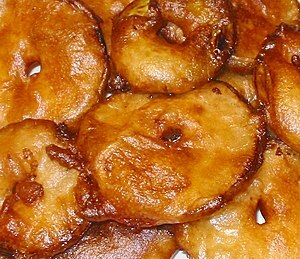 There are many versions of apple fritters here in the US. Some are made with yeast and resemble a lumpy doughnut. But all are fried, so watch out for the calories and fat content. Starbucks’s version is yummy, but it packs a whopping 420 calories and 20 grams of fat. This authentic Dutch recipe that I found appears to be lighter on the calories and fat, but don’t over-indulge!